It would be remiss of me to write about life in Yellowknife without mentioning mining. The city – which started off as a gold-mining settlement in the mid-1930s – makes “Diamond Capital of North America” one of its many claims to fame. Despite the tagline, there are no diamond mines close to town. However, the rough diamonds from the mines end up in Yellowknife, and this northern capital city could be considered a diamond in the rough itself. The last gold mine closed in 2004, by which time two diamond mines were already in operation in the territory. Diamonds were first discovered in 1991 near Lac de Gras, some 300km north-east of Yellowknife. There are currently four productive diamond mines in Canada, three of which are in the Northwest Territories and the fourth one is in northern Ontario. 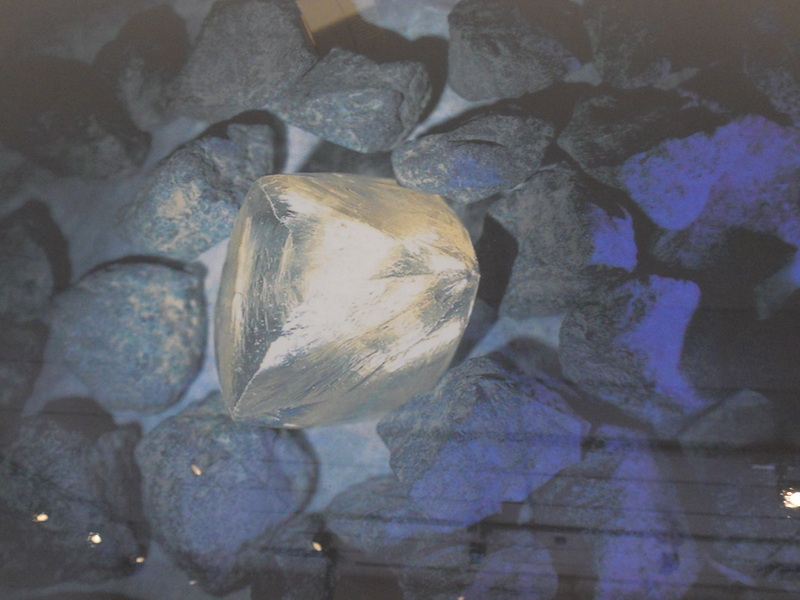 The initial discovery resulted in the formation of the Ekati diamond mine, Canada’s first. Majority-owner BHP Billiton was bought out in 2013 by Dominion Diamond Corporation (formerly Harry Winston). 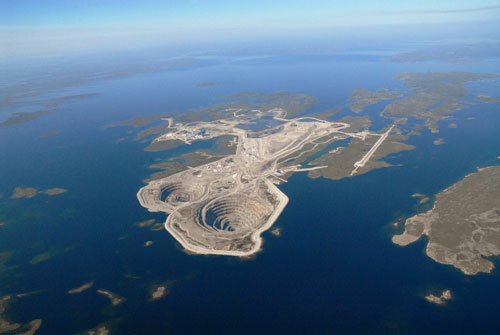 On an island on Lac de Gras is Diavik diamond mine – the largest of the three – owned by Diavik Diamond Mines (a subsidiary of the Rio Tinto group) and Dominion Diamond Corporation. 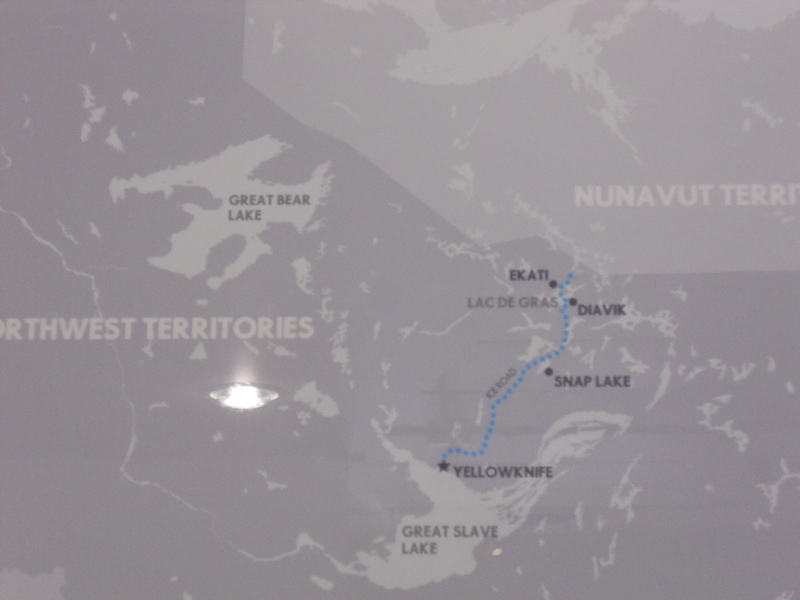 Last, but not least, there is Snap Lake, about 200km north-east of Yellowknife, owned by De Beers. The mines are a combination of open-pit and underground mining. The frigid conditions of the tundra were not the only engineering challenge involved in the construction of these mines. Due to the fact that the diamonds are underneath the lakebeds, dykes first had to be constructed to keep the water out to allow for mining. Their giant concentric circles look like impressions left by alien spaceships. There are no roads leading to these remote locations. As a result, employees live the fly-in/fly-out lifestyle, i.e. flying in from Yellowknife or Alberta to work at the mines and flying out to return home, on rotations of varying numbers of days or weeks. Mine sites are essentially small, self-contained communities, including recreational facilities. During the winter months, the mining companies contribute to the construction of an ice road, so that heavy equipment can be transported by land to their sites. A lot of planning must go into running these mines, because they have about 3 months to truck in the equipment that they’ll need for the next year. I’ve always thought that it would be fascinating to tour a mine site. However, it would have to be a summer tour, because I think that Yellowknife-cold is as cold as I can handle, so the idea of going farther north during winter does not bear contemplation. 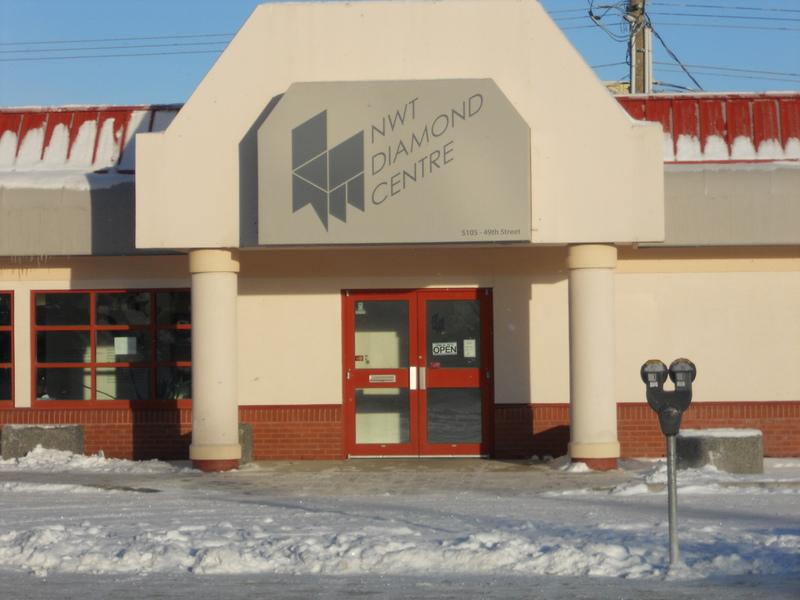 The NWT Diamond Centre opened earlier this year and it took me months to get around to visiting it. It’s run by Crossworks Manufacturing, and there are two aspects to it: a diamond cutting and polishing facility and a retail centre that sells diamond jewellery and also educates visitors on the journey of a diamond from the ground to market. Diamonds are formed in molten rock deeper than 150km below the surface of the earth. When carbon is subjected to extreme temperature – at least 1050°C – and extreme pressure, it crystallizes. Volcanic activity pushes this rock towards the surface and when the magma cools it forms a bluish igneous rock called kimberlite. Due to its cone shape, it’s referred to as kimberlite pipe, and it’s the holy grail for geologists in search of diamonds. But the pipe isn’t always easy to find. There are certain indicator minerals that point to the presence of kimberlite, such as garnet. So the task of the prospector is to trace these indicator minerals to their source kimberlite pipe. Most of the pipes in the Northwest Territories were formed by volcanic activity that occurred between 45 and 75 million years ago. The presence of kimberlite pipe doesn’t guarantee the presence of diamonds, nor that they will be economical to extract. Besides being a girl’s best friend, diamonds are the hardest known naturally-occurring substance. 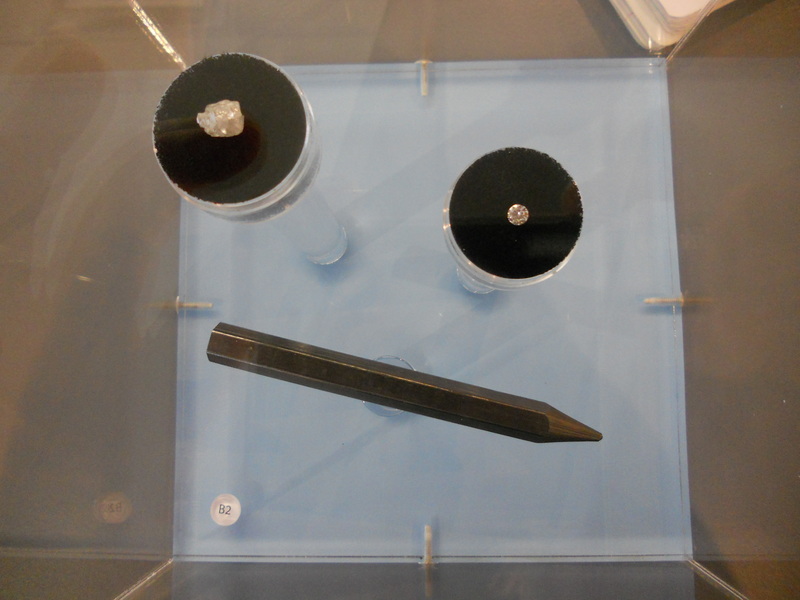 It’s interesting to note that graphite is identical to diamond in that they are both composed of carbon. But their molecular structure is different so they are at opposite ends of the scale when it comes to hardness. The process of getting the diamonds out of the rock is highly mechanized. Diamond-bearing kimberlite ore is extracted, crushed into smaller particles and mixed with water. Ferro-silicon sand is added, which amplifies the effect of gravity. The resulting slurry is fed into cyclones that easily separate the heavier diamonds and other minerals from the rock, based on density. The processed kimberlite then becomes a waste material and it is moved into a storage containment area. A magnet attracts the ferro-silicon out of the slurry to be reused. 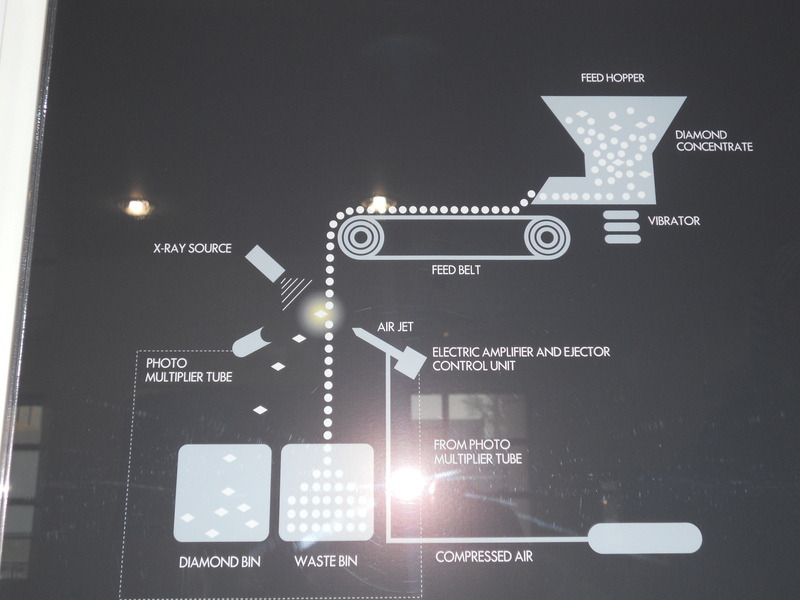 The valuable portion of the slurry is then put throught a feed hopper onto a conveyor belt and passed under X-ray light, which makes the diamonds glow. Photo-electric sensors pick them up and shoot blasts of air to literally blow them off the conveyor belt into the collection bin. Everything else is considererd waste material and goes to the storage containment area. In the case of underground mining, some of the processed kimberlite is mixed with cement and used to refill the space created by the extraction. The next part of the process is the cleaning and sorting of the rough diamonds, which is done at one of the 2 sorting and valuation facilities in Yellowknife. The diamonds are cleaned using chemicals and sorted by carat weight. It is said that the word “carat” comes from the Greek word for carob seed, because the carob seed was originally the unit of weight for gold and diamonds. 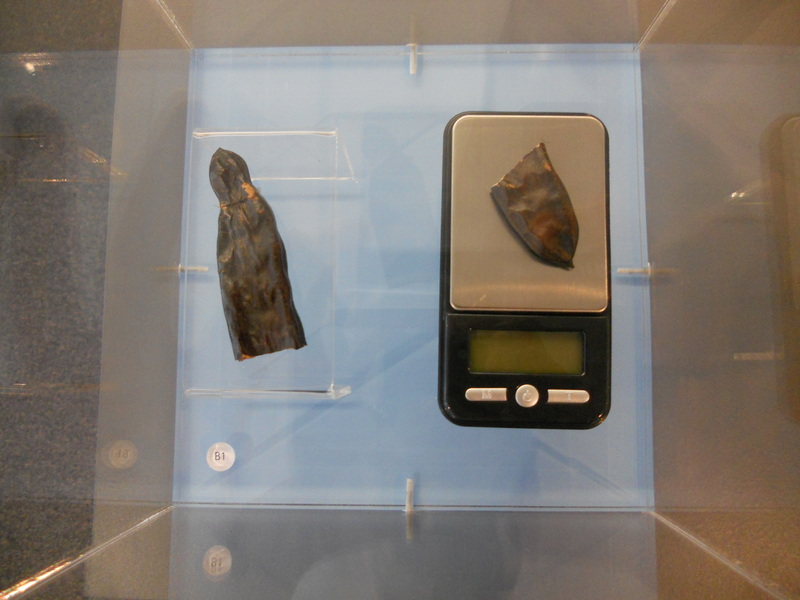 That may be an old tale of dubious veracity, but what is certain is that nowadays, 1 carat = 200mg/0.007055oz. Carat – the size or weight of the diamond. Cut – the shape or the outline of the stone, e.g. octahedron, dodecahedron. Some shapes are more desirable than others and I’m guessing that the shape of the raw stone influences the shape of the finished product, but they are not the same. Below are common cuts of finished diamonds, i.e. their shape when viewed from above. Clarity – the quality or how clean the diamond is inside. Most diamonds contain flaws in the form of carbon spots or bubbles or cracks. They are undesirable not only because they render the diamond physically imperfect, but also because they impede the flow of light through it. After all, the allure of a diamond is its sparkle. These flaws are not detectable with the naked eye. I was able to look through a loupe, (the magnifying glass used by gemologists) to see spots inside a finished diamond. Some of these flaws (called inclusions) can be eliminated during the polishing process, but diamonds containing them are sold all the time. A flawless diamond is rare indeed. Colour – diamonds can be any colour; it depends on which impurities are present during their formation, as well as on temperature variations. Some colours are more valuable than others: the highest colour grade is the least amount of colour, so for example white diamonds are more valuable than those containing tinges of yellow or brown. However intensity of colour is important. So an intense yellow diamond would be quite valuable, as would a red (the rarest colour), pink, blue, green or purple one. These colours are considered “fancies” and command a high price. Some colours dominate certain regions. For example, the Argyle mine in Australia produces the largest quantity of pink diamonds in the world. There are coloured diamonds in the Northwest Territories as well, but most of them are white, which is only fitting in a land of ice and snow. After all of the factors are taken into account, the diamonds are valued and either assigned to the various mining partners, or sold to manufacturers, who will cut and polish them. To be a lapidary is to have a skill that requires a fine eye for detail, extreme patience and the ability to sit for long hours. It can take hours, days or even weeks to finish a diamond. A manufacturer must first assess the rough stone to determine what can be made from it, which is the planning part of the process. It’s possible for more than one finished diamond to come from a single raw stone. It’s all in the way that it’s cut. The location of the inherent flaws and how to preserve the weight must be taken into account when planning how to cut the stone, because the ultimate objective is to obtain maximum value from it. These days, this is all computerized with 3D models. Next is the actual cutting – called cleaving or sawing – of the diamond into the separate pieces that will become finished stones. Since a diamond is such a hard material, cutting is done with a laser or a saw encusted with diamond dust. The cut diamonds must then be shaped. The hardness of the substance limits the tools that can do this. This part of the process is appropriately called bruting. It can be done the modern way with the precision of a laser, or the old-fashioned way with friction, where two diamonds are set on rods that spin in opposing directions and they are rubbed against each other. Then the cut stones undergo their first stage of polishing, to create the initial facets in them. This is done using a polishing wheel, which is a turntable that’s covered in a diamond paste. The friction against the rough stone removes any remaining grit. This same type of wheel is used to do the final polishing, which puts the shine on the diamond. I was treated to a diamond polishing demo at the NWT Diamond Centre. Demos take place a couple of times per week and are popular with tourists. The last stage is inspection and once the diamonds pass, they are sold to jewellers, who will set them into various designs. In the Northwest Territories there is a certification process that attests that the diamond originated here, that it was mined using environmentally sound techniques and that it’s conflict-free. There are no blood diamonds here, only ice ones. Each diamond is assigned a unique number, via which its owner can track where it originated and who cut and polished it. The Government of the Northwest Territories issues a certificate of authenticity, complete with the official polar bear seal. 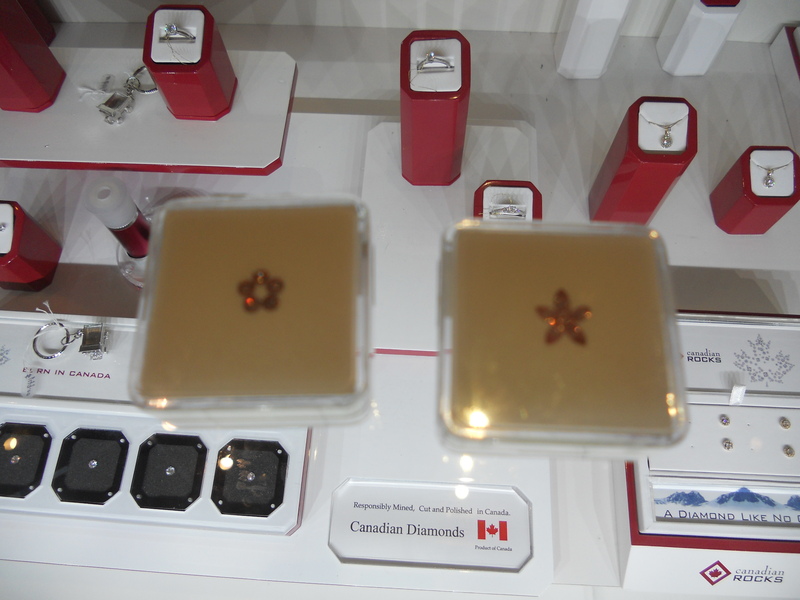 So if you’re looking for certified good diamonds, the NWT is the place to be.